"So, I'll go out on a limb and say that there may be some validity to this. I messaged with a friend and her response is attached here. She had the new APC album a week before it dropped, so I trust her sources. She has 100 percent certainty that the new album will be released before the end of the year. Adam did say the number 7 will have significance on this album. 7 songs. Total track length: 77:88. Fight me." It's hard to take these rumors seriously anymore after being let down for so many years. It'll be out when it's out. I'm trying to suppress my own personal hype so as not to be let down for the nth time, I want to hear new Tool so, so bad, but I'm shooting for next year in my head. If it's before then I'll be that much happier. If it’s ready then release it now. You won’t get more sales by waiting until Xmas. Cool! About time I must say! Today, it's Maynard who offers the update, which is notable because Maynard is not one to make false promises. It seems all his "scratch" vocals or demo vocals were recorded a while ago and the band is finishing up guitar tracking before moving onto final vocal tracking – the last step in the recording process. From there, as Maynard notes, it's then off to mixing and mastering. Maynard only has a few weeks to finish as he's about to hit the road with A Perfect Circle for a pretty extensive set of dates. 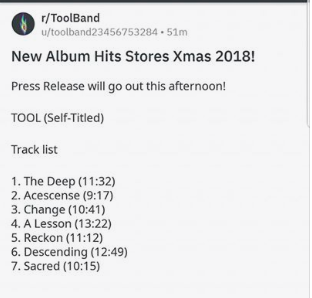 It seems like we won't be hearing new Tool this year, but next year seems to finally be the year. So much for yet another rumor. Thanks for the update Josh! Hey man, we're getting closer! Is it too soon for a Billie Jean King joke? It's about Fargin time Maynard! Mid April according to Danny Carey! Apparently songs are in post production sans one. Can’t get here soon enough. Feel like a kid with this release. So much anticipation. I listened to 10,000 days over and over for months when it came out. Mid April, now May - July. In the past Maynard has said records do best with fall releases... probably changed since the last time they put out a record. At this point it's impossible to live up to the hype, but I hope it's generally enjoyable. I bet they put out an outstanding album. God I hope it comes out this year but I'll believe it when I have it in hand. We've waited long enough! Now we have 13 years! Come on Maynard. Btw if any of you do not have the complication Salival, get it. Best cover of Led Zep’s No Quarter I heard. Plus a version of Pushit live that is killer.